Once you choose the McLaren product, submit a quote request or call our customer service department. A dedicated McLaren sales representative will contact you within 24 hours to provide you with information about availability, price and product characteristics. McLaren Deutschland GmbH accepts payment by wire transfer and PayPal. 2. MAY I PURCHASE A SINGLE TIRE OR TRACK? Yes, you may purchase a single tire or track; however, we do recommend ordering in sets when possible to maximize machine performance and balance. 3. WHAT SHALL I DO IF I CAN’T FIND MY MACHINE IN YOUR PRODUCT FINDER? If you cannot find the make and model in the search box, this does not mean that we cannot offer you a solution. Please, contact our sales department at sales@mclareneurope.com for further assistance. 4. WHAT SHALL I DO IF I ORDERED THE WRONG PRODUCT? Keep calm and contact us at customer.service@mclareneurope.com. Our dedicated team will help you find the right product and fix the mistake. Make sure to have your order number and in case you already received your goods – the serial number and SKU of the product. You can find this information on the label. 1. HOW SHOULD I PAY? McLaren Deutschland GmbH accepts payment by bank wire transfer or by PayPal. No other payment methods are currently accepted. The amount due should be transmitted net of bank charges. Sending bank and Intermediary bank charges that occur shall be the responsibility of the Customer. NOTE: VAT registered companies outside Germany: Please, transfer the due amount form the bank account of the invoiced company. Payments from the bank account of another person or company different from the one placing the order will be returned which will lead to order cancellation. 2. HOW DOES IT WORK WITH VAT TAX? This tax is calculated on the value of the whole order including shipping. If you are ordering from a European country and you do not provide a valid VAT number, McLaren Deutschland GmbH will charge 19% VAT tax. If you are ordering from a non- EU country we will not charge VAT tax. NOTE: VAT registered companies outside Germany: Please, transfer the due amount from the bank account of the invoiced company. Payments from the bank account of another person or company (different from the one placing the order) will be returned which will lead to order cancellation. 3. HOW LONG DOES A BANK TRANSFER TAKE? An inland bank transfer in Germany takes 1-2 working days; however international transfers from one country bank to another may take up to 3 working days. 4. CAN I GET A DISCOUNT IF I ORDER 2 OR MORE SETS? We have various promotions and items on sale. Contact our sales representatives to get the best offer for the desired McLaren product. 5. I WANT TO BECOME AN AUTHORIZED MCLAREN DEALER, WHAT IS THE PROCEDURE? To join our dealer network, simply contact us and a McLaren representative will get in touch with you shortly to find out more about your company and to provide information about our dealer conditions. 1. WHAT IS THE SHIPPING COST FOR MY ORDER? DO YOU SHIP TO MY COUNTRY? Shipping and handling fees vary depending on your desired shipping destination and the total weight of the order. We can arrange worldwide deliveries. We have flat shipping rates for most countries in Europe and we can offer you a total price for the product straightaway. For some countries, we would need several days to check the relevant cost of delivery. For more details, please call us or contact us at customer.service@mclareneurope.com to get your shipping rate. Any loss or damage to products that occurs during transportation by a carrier selected by McLaren is McLaren's responsibility. This means that the risk of loss and title for such products pass to you upon our delivery to your designated shipping address. Shipping route and means of transport are subject to our discretion. McLaren disclaims any liability thereof. McLaren disclaims any liability for delay of delivery resulting from third party, incomplete or inaccurate destination address provided by the customer or other circumstances beyond the scope of control (force majeure). Re-consignment charge may apply. Estimated transit time within Germany is 2-3 working days from dispatch under normal conditions. McLaren Deutschland GmbH could not be held liable for delays caused by third parties or any unpredictable (force majeure) circumstances. McLaren Deutschland GmbH can organize express shipments. Orders must be submitted and paid by 12 am for same day dispatch and delivery on the next working day. Express shipments can be executed from Monday to Thursday and on working days only. To organize an express shipment, please call our Multilanguage Support hotline or contact our Customer Service department at customer.service@mclareneurope.com. Additional rates will apply so check out our schedule of Supplementary fees. Deliveries are organized by a third party logistics company appointed by McLaren. The above transit days are an estimate and McLaren Deutschland GmbH could not be held responsible for any delays. We can ship to all other countries within the EU upon request. To get a quote contact our Customer Service Department at customer.service@mclareneurope.com. We also ship to non-EU countries. McLaren Deutschland GmbH offers daily deliveries to every address in Switzerland. All orders to Switzerland are subject to 40 Euro Import Documentation fee regardless of whether the Customer is a private person or a registered company. In addition all orders above 1000 Euro are subject to 55 Euro Export Documentation fee. Goods imported from Germany in Switzerland are subject to local import duties and VAT at the responsibility of the customer. It is the responsibility of the customer (and not of McLaren Deutschland GmbH) to inform himself of the relevant local charges. McLaren Deutschland GmbH offers deliveries to Norway twice a week. Orders to Norway above 1000 Euro are subject to 55 Euro Export Documentation fee. Goods imported from Germany in Norway are subject to local import duties and VAT at the responsibility of the customer. It is the responsibility of the customer (and not of McLaren Deutschland GmbH) to inform himself of the relevant local charges. We can arrange delivery to other cities in Turkey upon request. Please contact us at customer.service@mclareneurope.com for a quote or call our Multilanguage support. McLaren Deutschland GmbH charges 45 Euro for issuing ATR certificate. 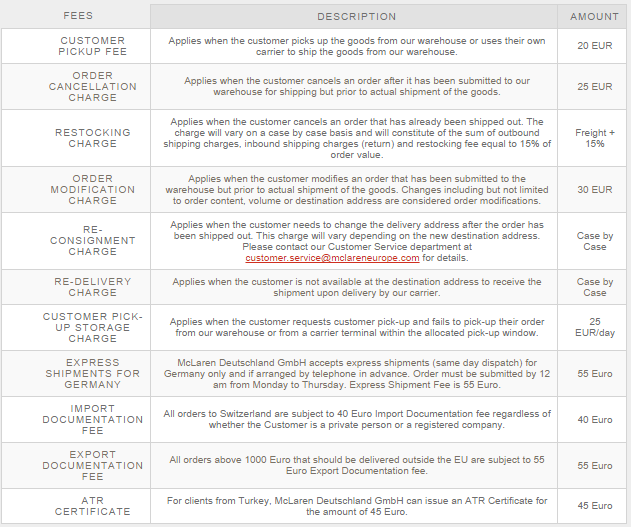 All orders above 1000 Euro are subject to 55 Euro Export Documentation fee. Goods imported from Germany in Turkey are subject to local import duties and VAT at the responsibility of the customer. It is the responsibility of the customer (and not of McLaren Deutschland GmbH) to inform himself of the relevant local charges. 3. DO YOU DELIVER TO COUNTRIES OUTSIDE EUROPE? International customers are responsible for custom clearance of the goods in their countries. We strongly recommend informing yourself of the required documents and applicable duty taxes and fees for the ordered products. McLaren Deutschland GmbH. would not accept back goods made more expensive due to local taxes and duties. Organizing the export and transportation of the returning goods is a responsibility of the customer who sends the goods back regardless of the reason. For more details, please refer to our Return Policy section. All orders above 1000 Euro are subject to Export Documentation fee of 55 Euro. 4. MAY I USE MY OWN LOGISTICS COMPANY? Yes, you are free to organize your own transportation. Conditions and additional pick-up fee apply if customer wishes to pick up directly from our warehouse. Please, contact us at customer.service@mclareneurope.com for more details or refer to our Pick up Procedure. 5. MAY I PICK UP MY ORDER? Yes, you have the option to arrange pickup directly from our logistics warehouse. For any orders picked up by you directly from our logistics distribution center or shipped with a customer-selected carrier, risk of loss or damage and title for such products shall pass to you upon delivery to you or your carrier. If you or your appointed forwarder fails to pickup the order within the allocated pick-up window, a pickup storage charge will apply as per our schedule of Supplementary Fees. Conditions and additional pick-up fee apply if customer wishes to pick up directly from our warehouse as below.For shipments within Germany: Upon placing an order you have the option to arrange pickup directly from our logistics warehouse. A Pickup Fee of 20 Euro per order applies for standard packaging. Check out other Supplementary Fees that may apply and follow the procedure below. Step 1. Contact us at customer.service@mclareneurope.com to arrange the date and time of pick up. Working Time: Monday to Friday 9am – 3pm Step 3. Provide a 24-hour advance notice to McLaren of the desired pickup date. Step 4. Once at the warehouse, provide the shipping reference of your order to the warehouse employee - invoice number (i.e. MCLDE206), proforma invoice number (i.e. ESTDE206) or Packing list. Note that goods are released from our warehouse only after McLaren Deutschland GmbH receives the full due amount for the order in its bank account. McLaren Deutschland GmbH applies a VAT tax of 19% on the whole order. This amount is returned to the Customer’s bank account only after the customer sends us a copy of the export documents by email and the original export documents by post. International customers from EU member countries should be VAT registered to be eligible for VAT return after sending export documents. If you export by ocean or air freight with your own forwarder you need to provide us with the relevant proof of export. The pickup procedure for international customers is the same as for customers in Germany (Step 1 - 4 above). 6. WHAT SHOULD I KNOW IF I AM EXPORTING THE PRODUCTS? If the product(s) that you are ordering are meant for purposes of export, you must obtain from your local government the appropriate export documentation before shipping the product(s) to a foreign country. In addition, any express warranties may vary or are potentially voidable if the product(s) are exported outside Europe. Please contact our Customer Service department at customer.service@mclareneurope.com if you have any questions regarding the exportation of our products. 7. ARE THERE ANY ADDITIONAL FEES THAT I NEED TO BE AWARE OF?